Mumbai: New launches and festive season discounts propped up September sales of most car makers in India except market leader MarutiSuzuki India Ltd, which saw labour unrest contributing to a 17% drop in sales compared with a year earlier. Car sales have been sagging for the past few months on account of interest rate and petrol price hikes. But most car makers bucked the trend in September, which marks the beginning of a three-month festive season, by unveiling new models and offering heavy discounts to offset the negative sentiment of the “Shraddha", a period in which Hindus remember their dead ancestors and typically avoid purchases. Mahindra and Mahindra Ltd’s sales went up 25% to 44,137 units in the domestic market, led by robust growth of utility vehicles and small commercial vehicles. Hyundai Motor India Ltd saw sales expand 13% to 35,955 units. “We will launch our much-awaited compact car Eon this month," Arvind Saxena, senior vice-president, sales and marketing, Hyundai India, said in a statement. “In spite of a sluggish market, we expect Eon to boost our sales and increase market share." Maruti Suzuki’s sales plummeted to 78,816 units in the domestic market in September, mainly because of a month-and-a-half-long stand-off between workers and the management at its Manesar plant, which makes the Swift, SX4 and A-Star models. Even models such as the Alto, WagonR, Ritz, Omni and Eeco—which account for the bulk of the company’s sales and were unaffected by the stir as they are produced at the Gurgaon plant—took a beating, reflecting a slump in demand. The unrest at the Manesar plant was called off on Saturday. The outlook for the coming months is not sanguine. A report released last week by Crisil Research, a division of Crisil Ltd, expects car sales to touch the lowest in a decade. “Petrol price hike of ₹ 3.14 announced on 15 September 2011 followed by a rate hike of 0.25% by the RBI (Reserve Bank of India) on the subsequent day have led us to revise our demand downwards from 8-10% to 0-3% in passenger cars," it said. 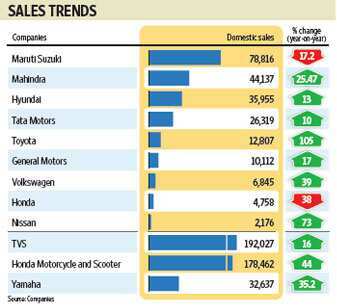 Sales of foreign car makers, including General Motors India Pvt. Ltd, Ford India Pvt. Ltd, Toyota Kirloskar Motor India Pvt. Ltd, Volkswagen Group Sales India Pvt. Ltd and Nissan Motor India Pvt. Ltd, expanded on the back of launches of new models, albeit on a low base. During the month, Toyota launched diesel variants of the sedan Etios and the hatchback Liva, while Nissan entered the sedan market with the Sunny. Other key launches included Honda Siel Cars India Pvt. Ltd’s compact car Brio and Mahindra’s XUV500. Relatively insulated from the hikes in petrol prices and interest rates, two-wheeler firms continued their growth momentum.